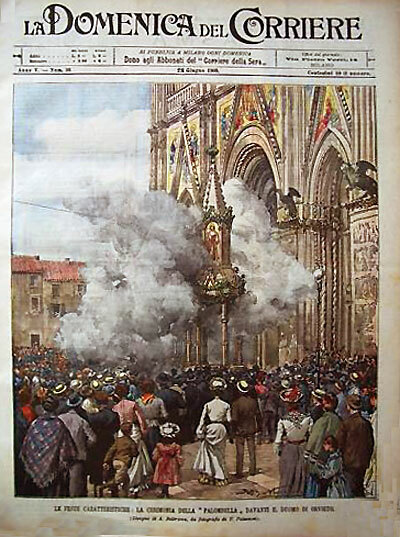 Each Pentecoste Sunday for centuries, a large crowd gathers in front of the Duomo di Orvieto to celebrate the Festa della Palombella. Despite the condemnation of animal rights advocates, a dove is placed in a plexiglass “space capsule” and launched on a zip-line across the Piazza. It arrives at the specially constructed cenacle with great fanfare of fireworks, red flames and clouds of smoke. The dove symbolizes the descent of lo Spirito Santo (the Holy Spirit) on the Apostles. 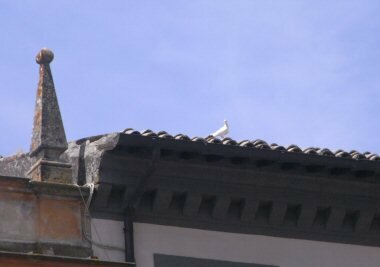 It’s said that if the dove survives the traumatic journey, it portends a year of good crops and fertility for the city’s most recently wed couple, who vow to care for the dove until its natural death. Apparently, this year “la colomba” had other plans! Somehow the container had opened prematurely and amidst a cheering crowd, the dove made her daring and defiant escape – literally and figuratively – she “flew the coop”. The question remains: If a “surviving” dove signifies a year of favorable crop yields and a “deceased” dove predicts a weak harvest, then it’s good news for farmers since a liberated dove is certainly “alive and well”. But what is the fate of the newlyweds who were deprived of their blessing of peace and fertility? I have no doubt that every bar in town is humming with speculation about this twist of fate! The discourse and theorizing could go on for the next 365 days! Have just found your blog and am really enjoying reading it. So, are you in Orvieto now? Or still in the process of trying to get here? The paperwork can be a killer as I must renew my residency permit next month. Just the thought of it is enough to make my eyes glaze over as I run screaming into the street. Not really. But almost! “Met” you as we both left comments on Rebecca’s FB post about !! today… Ciao!